AAE, HLE, OBIS, AT, SkyTEST. An ambitious patching project to forward all perks/bonuses of the mods to mod-added enemies, and resolve conflicts. Props to all of the mods and authors listed in the "Required Mods" section of the descript. Their mods have greatly improved gameplay, difficulty and fun during my last playthrough. Bethesda for the canvas and the general background which mods improve upon. My 1.3.0 patch with small tweaks, fixes and patches, and compatibility for mod updates. Invisible mudcrabs will lose their cloaking spells instantly. More OBIS bandits will realize they are part of OBIS banditry. Female bandits will now start flaunting their stuff and walking like... well, females. All newly-added SkyTEST animals are once again patched. (Mini)Bosses release version. Some named Unique enemies have had stats, attributes and perks readjusted. Bring a tank! DLC1 support! Covered most of Dawnguard NPCs that are used and needed tweaking. Re-tweaked animal edits (again)--animal behavior between breeds (e.g snowy/regular) is now *slightly* altered. Vale animal support! Now the glowies follow SkyTEST packages! Added some DLC2 automatons. Ballistas are now much more deadly. BEFORE DOWNLOADING: This patch will make enemies you face a lot more challenging. This is intentional. I will not make a lite version. A light version is available by not downloading this patch, and uninstalling the mods this patch edits (all difficulty and diversification mods). Everything is explained within reason by this description. I have edited (so far) just shy of 700 NPCs by adding perks and adjusting scaling, I will not be naming each one off see 'conflict winners' section for more information. All edits were made by hand using xEdit. You are responsible for reading everything that might pertain to you before use. Finally, I intend to support this 100% until I can find nothing else to add or change. I am open to suggestions and would love error reports on missed items (perks not applied, a stronger enemy appearing easier to kill than a weaker version, etc). This is a very large and ambitious project--Anything found and reported will improve the patch for all involved, including myself. So, I got annoyed when I leveled up and beyond AAE enemy levels to HLE enemies... and instead of getting harder, they got easier. This patch takes the best and toughest stats from the above mods and applies it to the enemies, making the higher level enemies have improved stats like the AAE vanilla variants. Added vampires will have undead immunity and increased physical attack damage (though some will use weapons unless disarmed). Some enemies have even received a level/attribute boost or added effects to improve compatibility and increase variety. Even so, this is not a pure difficulty mod. Notably, animals: prey and weaker predators are now level-capped below what they were set at before, stronger animal predators were left to scale. This was implemented because using my own Sectors mod, almost all animals were at 'grand soul' level, except for a few mod-added enemies. Dissecting that sentence--1: apparently, there were only grand skeevers (and prey) in my game, and 2: mod-added 'endgame' enemies were weaker than the base-game enemies when I was level 56+. While level-capped, animal enemies/prey have had health and stat increases to make them more difficult. Now, hunting animals to practice before turning your bow towards 'real' prey is very viable. Also, at the end of the game when you get stuck with a pile of 60+ petty soul gems, you will be able to fall back on hunting to fill them. If you prefer animals level up indefinitely, you can load the Animal Tweaks/SkyTEST patch below this patch (Not recommended due to the patch being outdated and the mudcrab glitch). If you prefer the level cap, my mod already edits and changes all of the animals covered in the patch so one will overwrite the other. Using the Animal Tweaks/SkyTEST patch will revert *most* of the changes (mod-added creatures will still have my edits). Furthermore, a lot of enemies have had their max level removed (largely only for conflicting records, only some mod-added). This will allow for more diversity at higher levels. Now, a bandit with lower stats can spawn in with high health/etc, in the same spot that an enemy who starts at that higher level with near maxed stats and attributes can. With increased spawn mods, both can. I may change this based on gameplay and feedback. This mod, like Sectors, is designed for players like me who like a challenge from the beginning of the game, until the end of it. The endgame enemies are fearsome, and may even give you a run for your money after getting 100+ smithing and enchanting, for those of you using the uncapper dll. Then again, this isn't even half of the mods my "difficulty improvements" folder, so millage may vary. The below mods are REQUIRED for this mod to work. A lot of what this mod does (besides balance conflicting records) is apply perk, skill, inventory, etc. changes to MOD ADDED RECORDS--something which no other patches (that I have seen) do. I WILL NOT make patches that do not contain these core files. If you use two or more of these mods, which is one of the only reasons to use this patch--you should consider getting the rest. They are excellent, highly-rated mods that are completely stable, even in my list of 300+ mods in only 250-ish esps (and 100+ hours in my old game, which I retired to make this patch and upgrade my mods--it was still stable). Dawnguard and Dragonborn HLE patches are now required! Below are the rules I patched the above mods with. There are very few exceptions if any. The higher the rule is, the higher precedence it has. E.G. SkyTEST controlling all things animal (rule #5) will still have stats increased (rule #1--likely from AAE), and will still have extra perks/factions/keywords added in by Animal Tweaks (rule #2). Patch-added Changes section below will override all conflict winner rules. 1) If the enemy had higher stats (skills, health, magicka offset, perks, etc.) the higher stats won. 3) Enemies that made sense had their level cap removed, minimum level updated (if applicable) and were scaled to level with the PC. Not all enemies were scaled, so there will still be some extra diversity for all levels. 4) Animals and Prey were level-capped so a higher-level player with encounter zone mods can still get souls of all sizes. 5) SkyTEST and Animal Tweaks won on any and all changes made by animals--Packages, factions, perks, stats. 6) OBIS had the final say in all things bandits. Most mod-added bandits were not altered so there will be some regular bandits... for now. 7) Advanced Adversary Encounters had precedence on all other enemies from all mods. First off, if a higher 'leveled' enemy touched by this mod had lower stats than a lower leveled variant, its stats were buffed. This is and will mostly be seen on enemies that were buffed by AAE being stronger than their HLE counterparts. Purely metal enemies (you know who you are) were made slightly more tanky in addition to AAE buffs. I seriously doubt a sword hitting a piece of solid dewmer metal will damage anything, but it's still possible. Slightly. From this point onward I will be tweaking enemies in some ways slightly and in other ways a lot. I will continue tweaking animal behaviors until they all fit my vision, and I will be making bosses into actual bosses. The bosses that are not quest-driven and you have to actually look for to find will be made to be nearly impossible without backup. Like actual boss monsters. This patch largely (for now) made changes and improvements to Dragon Priests, especially V1.2, which is the Boss Release. Named dragon priests are miniboses and will now be even more powerful than standard priests (and even AAE priests to an extent). It will be near impossible to take a mask from them, unless you are high leveled or have a lot of backup. HLE added priests are also very deadly when reaching levels 60 and 70. Level caps for dragon priests were removed. 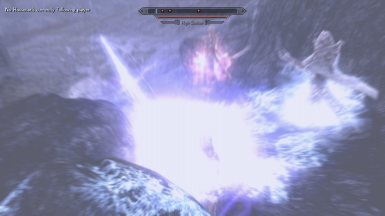 Some leveled items/spells were lightly edited to provide better variety and compatibility to mod-added dragon priests (nothing that most normal mods will touch). This patch also includes 3 missing priests AAE did not touch (they likely used template and flags, but I re-built them to ensure the changes stuck. Appropriate perks were added to priests to make battles even more difficult fun. Other main focuses were animals and level caps for them, and very lightly on bandits (largely unleveling them). For souls, prey species will almost universally have petty souls. 1-2 exceptions for lesser souls. Smaller and weaker predators will have lesser souls (wolves), and can level anywhere in the 'lesser' soul range. Atypical wolves may have up to 'common' level souls. Bigger predators will have common and greater souls, such as brown bears, cave bears and trolls. Giants are also capped (but by no means hindered) with greater souls. Apex predators (snowy variants or large predators) and very large prey (mammoths) have grand souls, as usual. So far, Dragonborn DLC (ash hopper netch, etc.) have not been touched. This version changes the rules of the game by making certain enemies into bosses (tougher than normal, larger magicka/stanima pools, additional perks). All named dragon priests are minibosses. Dragonborn dragon priests are bosses. Vahlok the Jailer, The Forgemaster, and Harkon are an epic bosses. Harkon should now have different perks and resistances in different forms. I need to test this eventually, until then I will rely on feedback. Also, if the changes occur as I believe, each time he enters a new phase (melee/magic) he will heal very slightly, and get a boost of either magica or stamina, dependent on the form. More exact changes (for those who must know or are interested in helping me test) are in the spoiler below. Magic - Magic resistance, absorbtion, increased magicka recovery, movement speed boost, increased magic boost/recovery. Mele - Avoid/reflect melee damage (might not work 100%), increased melee skills and defence. Faster stamina regeneration, increased stamina boost/recovery, and more energetic (should move around more). Both forms - increased damage and damage resistances. Soul Cairn enemies *and* summons now have weapon resistance perks added by AAE. Bonemen are counted as skeletons, Mistmen are counted as ghosts, Wraithmen are counted as undead. Vale saber cats and deer are now added to SkyTEST and Animal Tweak management. Difficulty is placed higher than base snowy saber (HLE snowy variants will still outlevel these at earlier levels). Download with NMM and install, run loot and wrybash. For advanced users, it is highly recommended to use xEdit and "deep copy as override" my patch into the bashed patch. Wrybash is having issues with not integrating all of the changes I've made and skipping multiple entries entirely. If you prefer animals scaling to your level without caps, ensure SkyTEST/Animal Tweaks patch is loaded a and overwrites my mod. Doing so is no longer recommended or supported as the patch is outdated due to SkyTEST's recent update. Enjoy a more difficult game. This mod currently edits just shy of 700 records, and is not yet 100% complete. 1) Make sure if you loaded this patch mid-game to wait in a cell with no enemies until all cells reset (I believe vanilla is 30 game days). 2) If the problem persists, please open the console, select the enemy, copy down the id #, and create a bug report with the name of the mob, the refid number, and the missing items/spells/perks/etc. Improved Vanilla Xbox Controller Scheme - Adds hotkeys, quick menus, unbound schemes to allow keyboard use, and other features! Lite version available. Soul Gem Amplification - A small mod to make soul gem upgrading more realistic, as well as re-add in the Shade of the Revenant, and more! Mightily Diverse Splendor-Belly Patch - Medium Cooked - Enhanved Mighty Dragons, DDC, ogSplendor, Bellyaches. A patch project made to enhance all dragons to the same or a similar level as Enhanced Mighty Dragons, for a more even play-through. Sectors - Legendary Unleveled Skyrim - Changes encounter zone levels by location (hold) and type (animal den, bandits, vampires). For a gradual, yet disparate play-through. TruSectors - Legendary Capped Skyrim - Lightweight overhaul which unlevels Skyrim, but caps each zone; based off of Sectors - Legendary Unleveled Skyrim. Shields of Ordinator - Edits Ordinator to provide two balanced damage-reduction perks for Legendary difficulty of Skyrim. Works well with Sectors! Hexhunter Bow - Replacer bow that is weak to most enemies, but deals increasing damage to magic users: the more base magicka an enemy has, the more damage it deals. Aimed for balance in higher difficulties. Small DLC and Misc Patch for XxAwesome_PotionsxX SSE - A small patch for users of XxAwesome_PotionsxX, a potions re-texture, that covers even more vanilla potions. Craftable and Upgradeable Potions of Well-being - Allows you to craft and upgrade potions of well-being.